I will explain why we call this dish Tiger’s Tears. You know when you grill beef on a barbecue and the fat or water drips on to the charcoal and makes a hissing sound? Well, the drops of water represent the tears and the hissing represents the tiger. My dad is absolutely crazy about grilled beef and this is his recipe. It goes so well with Thai whisky. Mix the soy sauce, coriander root, pepper and oyster sauce in a bowl. Add the beef and mix well. Marinate in the refrigerator for 1 hour. Meanwhile, put all the ingredients for the dipping sauce into a bowl and mix well. Transfer to a serving bowl. Preheat a griddle pan until very hot. Add the beef and grill for about 2–3 minutes, turning once, until cooked to your liking. 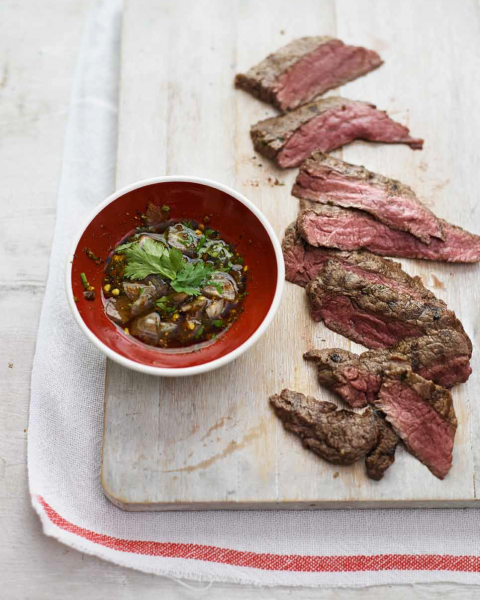 Slice and serve the beef with the dipping sauce.